During our research on cavity-nesting birds in the Wenas Valley, WA, we observed a breeding population of Gray Flycatchers. The species, a Neotropical migrant, has a widespread breeding distribution in the arid and semi-arid regions of the western United States. As a result of climate change, many Neotropical bird species are expected to shift their distributions northward as regional temperatures increase. A quick literature search revealed that few studies have looked at the nesting ecology of Gray Flycatchers and none have been conducted in the expanded northern portion of its range. For example, in 1972, the species was found breeding for the first time in Washington in the Wenas Valley, Yakima County, and can now be found as far north as the Okanagan Valley, British Columbia. 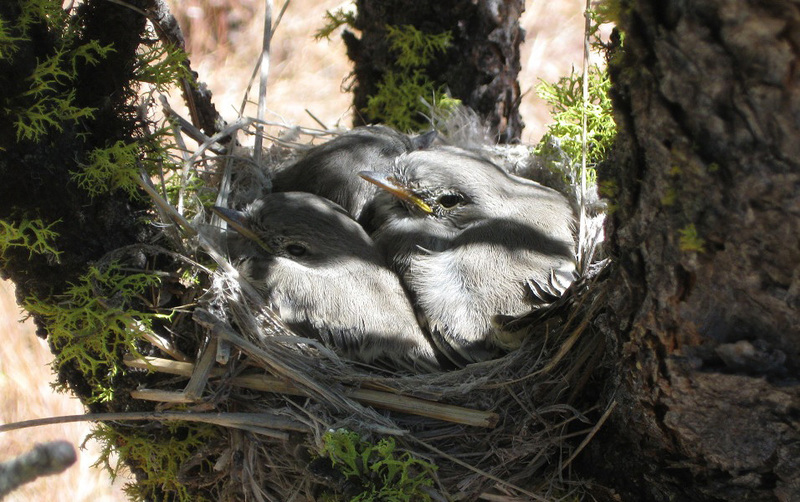 To expand our understanding of Gray Flycatcher nesting ecology, we initiated a study in managed ponderosa pine forests in the Wenas Valley in 2014 and 2015. Our objectives were to determine breeding density, describe nest-site characteristics and demographic variables, and examine spatial and temporal factors associated with variation in daily nest survival rates. We found that breeding density of Gray Flycatchers ranged from 23 to 34 territories/km2 and was similar to densities reported in other habitats throughout their range. Flycatchers nested almost exclusively in ponderosa pine trees (93% of nests) despite presence of suitable nesting shrubs (bitterbrush and wax currant). Nest placement in trees was highly variable in relation to height above the ground, with flycatchers either placing their nests on a horizontal limb against the trunk of the tree (56% of nests) or away from the trunk (44% of nests). Thus, Gray Flycatchers did not appear to follow any defined pattern in regards to nest placement. We used a logistic-exposure model fit within a Bayesian framework to model the daily survival probability of Gray Flycatcher nests. Predation was the cause for 90% of all nest failures and we estimated overall period survival for the entire nesting period to be 0.33 (0.16, 0.50 – 95% CRI). We found that daily nest survival was associated positively with nest height and distance of the nest tree to the nearest tree. Flycatcher nests in our study area are exposed to a high diversity of terrestrial and arboreal predators with varying search strategies. Due to this predation pressure, finding a safe nest site is challenging because all sites may be subject to similar predation risk. This possibility may explain why flycatchers locate their nests in such variable locations within trees. Why don’t all Gray Flycatchers nest high in trees and in trees at a greater distance from other trees? Finding the safest location may be the result of trial and error in which inexperienced females learn the safest place to nest through prior nest failures.